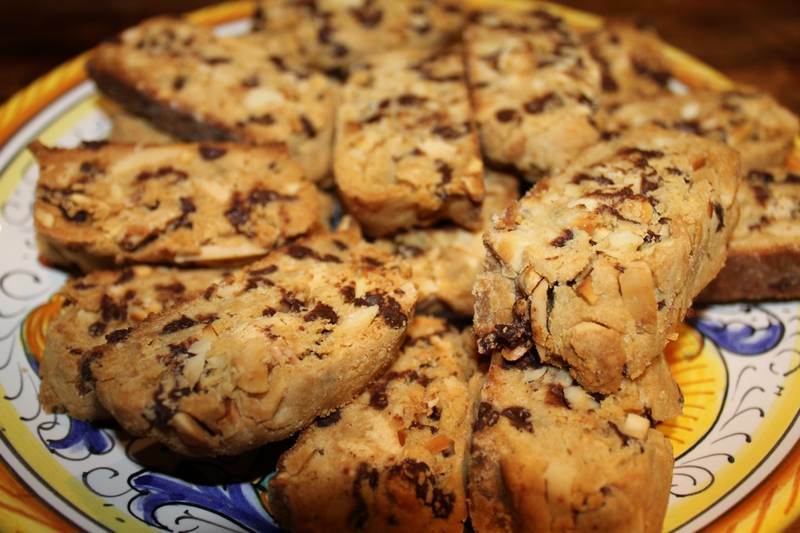 Triple Chocolate Almond Biscotti – Treat your palate! Any occasion where food is served piques my interest. Peggy Ann Turner staged a wonderful art show and baked her own treats for visitors. As usual, I asked for the recipe, explaining how it would be shared. Lucky for us, Peggy Ann readily agreed. These biscotti taste unique. They have a sweetness that demands your attention, a perfect texture and a lovely appearance. Preheat oven to 350F and line a large baking sheet with parchment paper. In a dry frying pan, toast almonds over medium heat until they are a light brown colour. Set aside to cool. With an electric mixer, cream butter and brown sugar together until soft, smooth and light in colour, about 4 minutes. Beat in egg and stir in nuts and chocolate chips. Add flour and stir thoroughly. 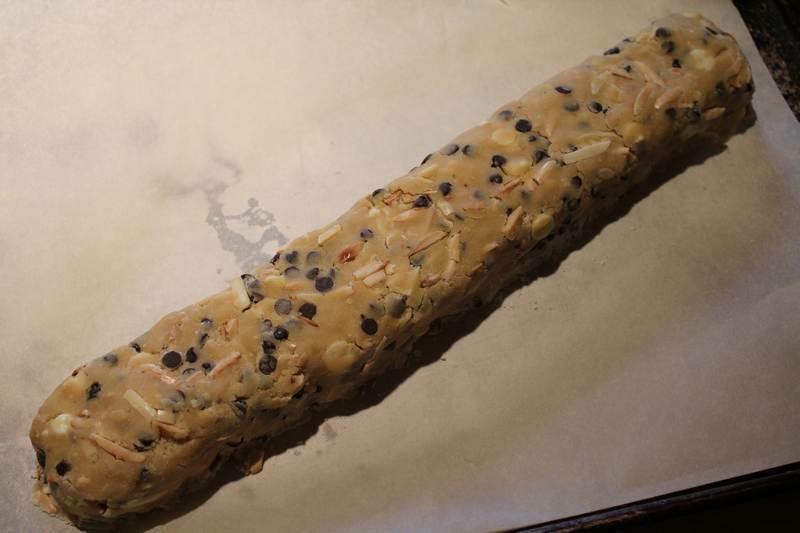 Shape dough into a 3 inch wide log and place on baking sheet. Bake for 25 minutes. Remove from oven and allow to cool for 30 minutes. Reduce oven temperature to 325F. With a serrated knife, cut log into slices just under 1/2 inch. Lay slices on baking sheet and bake for 20 minutes. 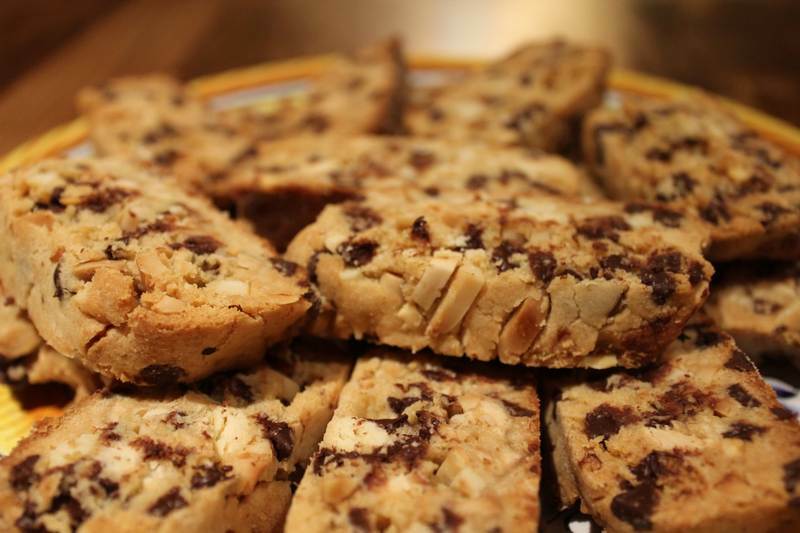 Biscotti can be stored in an airtight container for up to 3 weeks. Makes 20 biscotti. Thanks to Peggy Ann for this recipe from the Pan Chancho Bakery, in Kingston, Ontario. The photos and the beautiful segment of a Bali painting are courtesy of Peggy Ann as well. How can one woman be so capable? There may still be some extraordinary paintings available from Peggy Anne’s recent shows. In case you were wondering, Peggy Ann is also an architect and interior designer with tips for you on how and how not to decorate. Enter the draw before May 4, 2012 for Jittery Cook‘s Blueberry Gin. Fill out the comment form on Contact (above) to send me your best recipes to share. Only 5 entrants so far, so your chances of winning are excellent! If you prefer, you can remain anonymous.